The handsome GIFTABLES Jason frame of hand-polished metal enhances your favorite 4x6 vertical photo, and makes a brilliant statement when displayed on the mantle, desk, or shelf. 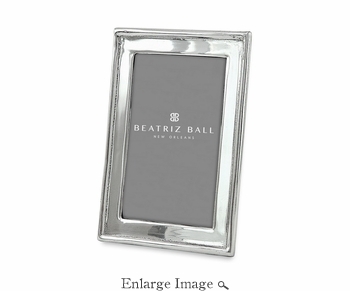 From our GIFTABLES Collection featuring handmade and artfully designed Beatriz Ball items at irresistible prices. Packaged in a lovely gift box, you'll love this handsome frame in one of our bestselling styles. Makes a luxurious gift for any occasion. The footed, self-standing frame makes a fine wedding gift, or for any special occasion, and is an elegant solution whenever a frame is called for. Sandcast and hand-finished, the frame is made of an easy-care aluminum alloy that never needs polishing. Tarnish free.